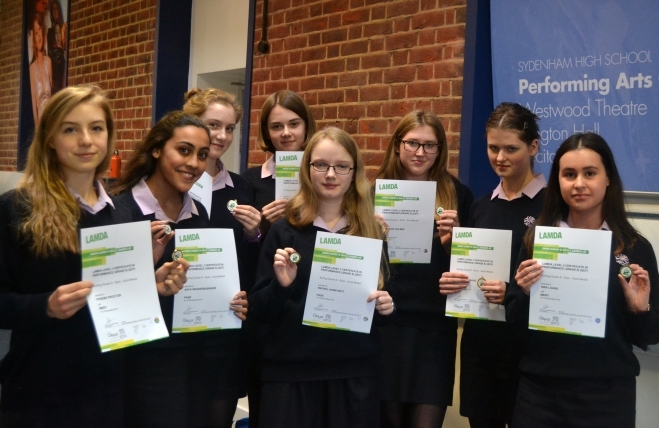 A record nine Year 11 girls have passed their Grade 8 (Gold Medal) LAMDA Acting exam, each gaining between 45 and 60 UCAS points. Anna Carrington, Helen Davey, Greta Holmes, Maddy Holmes, Rachel Honeysett, Kira Lound, Rachel Persaud, Phoebe Proctor and Anya Wickremasinghe have all gained the equivalent of an A Grade at AS Level. The girls had only just passed their Bronze Medals in May 2014. They made the commitment to come into school for lessons during the Summer holidays with LAMDA coach Anita Borge, taking reading away with them and resuming classes in September and October, so that they were ready to take their exam at LAMDA in November. Each student has learnt a lot during the process, from developing their organisational skills to realising what they can achieve by setting a goal. Now they have a full qualification in the bag and on their CV’s well before sitting their GCSEs in the Summer.